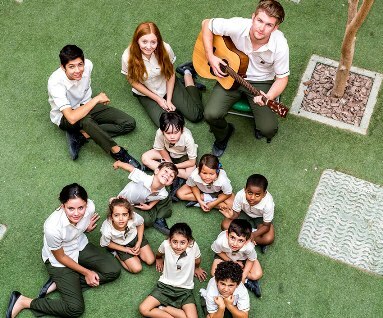 Greenfield Community School (GCS) is located in the heart of vibrant Dubai, in close proximity to the World Expo 2020 site and surrounded by modern amenities. Approximately 1,300 students enjoy state-of-the-art facilities on spacious grounds. GCS is one of only a few schools in the world to offer all four International Baccalaureate (IB) Programmes—Primary Years, Middle Years, Diploma, and Career. As part of the Taaleem Education Group of schools, leaders in international education in the region, the school has enjoyed strong growth over its 10-year history. In addition to being authorized by the IB Organization, GCS is fully accredited by the Council of International Schools as well as the New England Association of Schools and Colleges. While the K–12 student population represents 70 nationalities, nearly one-third is from North America and the U.K. The teaching staff of 99 includes 20 from North America, 40 from the U.K., and two from Dubai. GCS’s extensive array of extra-curricular activities (ECAs) offers students a variety of options to develop existing interests and explore new ones. 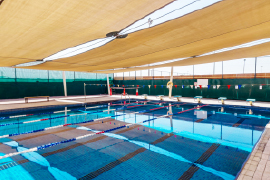 ECAs include many sports, such as football, netball, Swim Club, martial arts, rugby, basketball, volleyball, tennis, cricket, table tennis, and chess. Offerings for the arts include Music and Movement, choir, Art Club, Poetry Club, Drama Club, and Arts & Crafts. Other service and specialty clubs include Yearbook, Public Speaking, German Reading Club, Environmental Club, Arabic Story Telling, and Qur’an Club. While GCS teacher-led ECAs are included in the tuition fees, some ECAs are provided by an external company, and these require additional fees. Another vital part of GCS’s program is a range of educational visits and excursions to sites throughout the city. GCS is interested in hiring certified single teachers and teachers with a non-teaching spouse. They would consider teaching couples as well. All candidates must have a minimum of two years’ experience and possess an academic degree in the subject they will be teaching. Certified teachers under the age of 65 may obtain a work visa. GCS provides free housing the first year and a generous monthly housing allowance thereafter, including a sum for furniture. 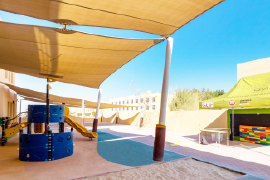 Annual airfare for all dependents is provided along with 100% tuition for up to two school-aged children at any Taaleem school, with the exception of the preschool, Children’s Garden. Since GCS is a full IB school, teachers without IB experience will be considered for full training once they begin their contract. The covered medical coverage extends beyond the U.A.E. to all Gulf region countries. The salary and benefits package at GCS offers an opportunity for savings or the chance for a family of four to live on one salary. Additionally, there are local employment opportunities for non-teaching spouses. To gain access to Greenfield Community School’s full profile on the Search Associates database, including a list of all open positions, candidates can apply for membership by clicking here. Candidates already registered can easily access the school profile directly through their dashboards.